Rivet Tag Rivet Style Pet ID Tag  - $7.00 : Your Pet Store, Made in the USA! This is a tag in the shape of an oval and is available in brass, or gold, only. This tag is also available in 2 sizes; the measurements of the tag small are 1 3/4" long and 5/8" wide, and the measurements of the large tag is 2 1/2" long and 1" wide. The rivet tag lets you have your information on a tag on your pet without having a tag that hangs down. The tag in the picture is the large rivet tag shown attached to a collar for display purposes. 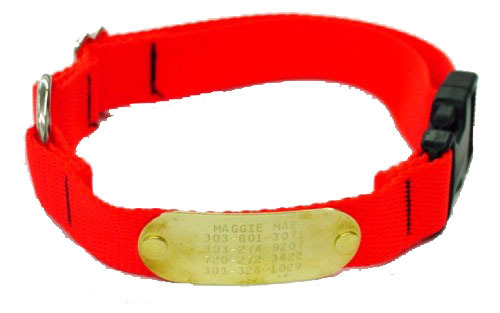 We provide the brass split rivet with instructions to attach the tag to the collar. If you purchase a collar with this tag, we will attach the tag for you.